Adults looking to challenge themselves without stress on their joints or members who just enjoy the water can take advantage of our different water exercise classes. 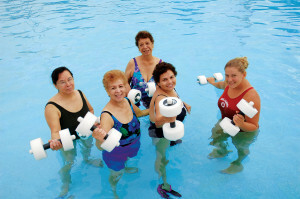 Instructors lead small groups through water aerobics, core strengthening and much more. Gain muscle conditioning and cardiovascular endurance from the aerobic choreography and the resistance of the water. Ideal for all fitness levels, non-swimmers included. Programs are free to facility members.